Great entertainers,professional presentation by locals. The Folk dancing & singing was so colorful and enjoyable. A fantastic night out, so colourful and entertaining, absolutely loved this. Great theatre, very good troupe even though they are still students and not professionals. Great theatre, very good troupe even though they are still students and not professionals. Fizz at half time and a chance to but some trinkets, not to badly priced either. This exhibition came to the ship and entertained us after dinner one night. This exhibition came to the ship and entertained us after dinner one night. Excellent entertainment. The only thing lacking was a synopsis. The only thing lacking was a synopsis. The talent and execution were excellent. But like going to an opera, you know there&apos;s a story but unless you speak the language you&apos;ll be lost. I had been to one of these in 1962. I had been to one of these in 1962. When it was real and traditional. Now it is slick and glitzy. Fun but designed for tourists. The venue was very impressive however. The show was good but the venue was very old and cramped. The show was good but the venue was very old and cramped. The seats were too close together and there were large columns blocking some of the view of the stage. We both enjoyed the show immensely. The setting was superlative for its history. The setting was superlative for its history. We&apos;re pretty familiar with Russian folkloric performances. This was absolutely the best we&apos;ve ever seen. This was a lot of fun and worth the money. This was a lot of fun and worth the money. It was also very close to the boat, so easy to come and go. This is how you get the true flavor of Russia through the centuries. Fun and they give you lots of vodka!!! Performance was very good, my wife did have some problem with the stairs here. Performance was very good, my wife did have some problem with the stairs here. Two Very Very large flights. This was a very good show in a former Imperial Officers&apos; Club building. This was a very good show in a former Imperial Officers&apos; Club building. We had champagne in the ballroom during intermission. Same guide as above. Excellent English. The show was very colorful and entertaining. The Russian Folk Dancers were very energetic!! The history and people of Russia in dance, song and story. 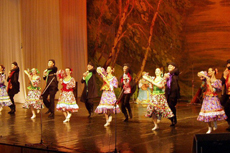 The history and people of Russia in dance, song and story. Great fun with champaign at intermission. This was an excellent evening and the singers and dancers were first class so highly recommend this.